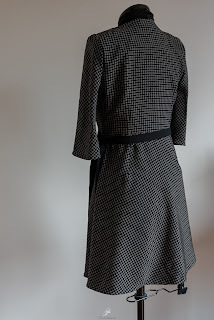 As suggested in ly last post, there is a happy end to my wrap dress story. The Eve dress being a normal-size pattern, I decided to keep it aside and get back to my Burda 113-09/2017 pattern. I rechecked my muslin from then and decided that if I cut the sleeves correctly, if I follow the cutting insctruction (which piece should be on the bias and which should not), that could work in the end. I also bought this very cute wool very stable jersey: "something on the black" ticks off the visual aspect. When I bought it I did not realize it was actually a jersey, even though a very thick and stable one. But I figured that I was giving myself all the chances to have some success with this dress. 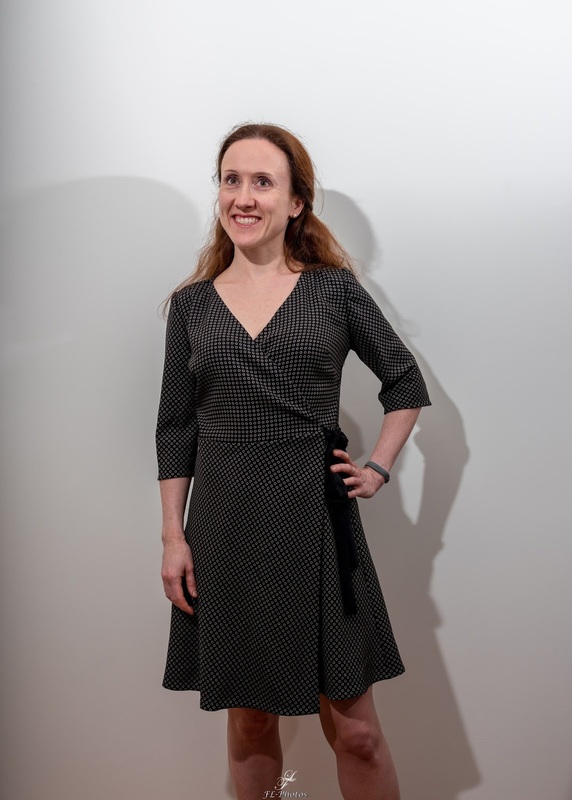 I did one change on the pattern though - I eliminated the waistband and added the corresponding length to the bodice. At some point of time I was worried I did not have enough fabric. I bought1.7m coupon, but there were some 20 cm of pure black hem - impossible to use it as a design feature. However, little puzzle playing and it got cut out. 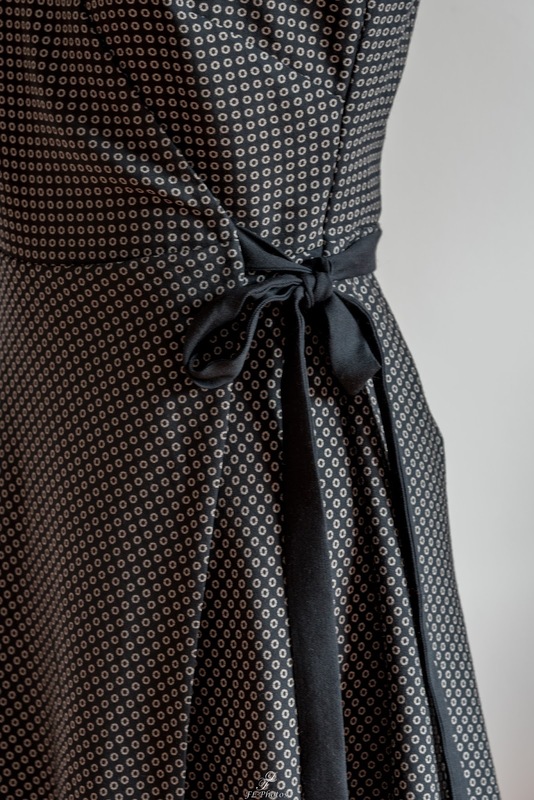 Then came the obsession with stabilizing: I reinforced heavily the bias cross hem, the laces (cut in black only) and the shoulder seams, as well as the vertical hems and sleeve heads (lighter interfacing used, though). 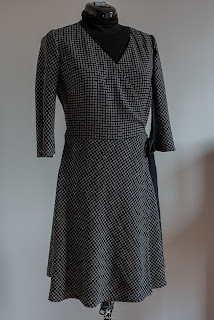 The construction of the dress was rather straightforward, as I have already sewn a few muslins of a wrap dress before. I finished the hems with self fabric in order to stabilize it little more (you never know), let the dress hang for a few days to even out the hem. I took some time to finish properly the hole for laces which was not so easy to figure out, since it is basically a hole in the side seam. 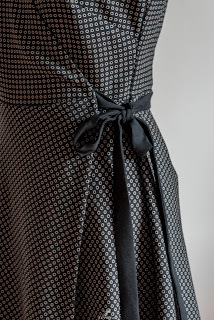 The whole dress is sewn with French seams, because i just want a nice finish, mainly on a piece which might get open. The final verdict: I really like this dress! 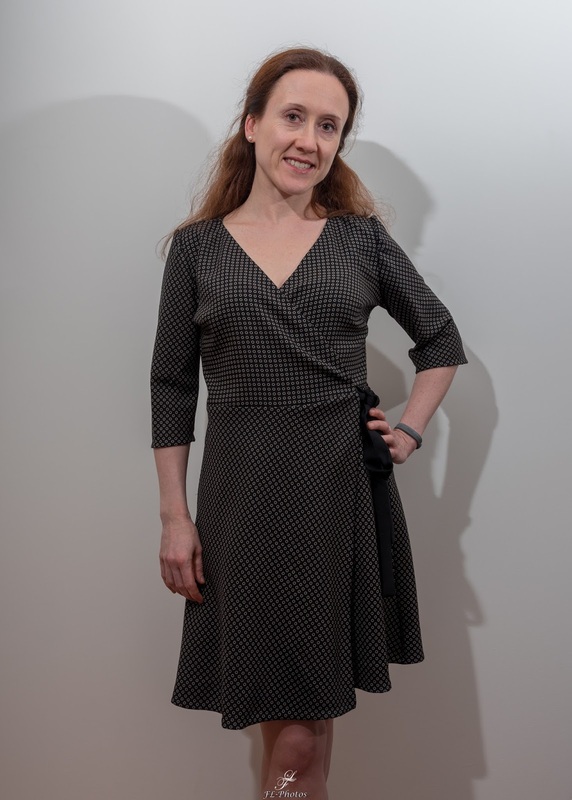 And finally, I sewed a wrap dress! There might still be a little details I would change little bit, but the fabric makes up for this and I really love the final result. In addition, the fabric being wool, it keeps me warm enough to start wearing it right now.